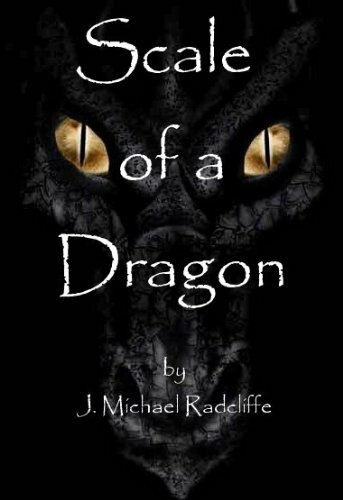 I do have a thing for fantasy, just like I have a thing for science fiction, and J. Michael Radcliffe’s short story Scale of a Dragon is a great peek into a fantasy realm I hadn’t visited before. The main character in the story is a young woman named Callen who lives alone in the woods with her very ill-tempered and extremely harsh father. His treatment of Callen is nothing short of abominable, and she is so beaten down by his verbal abuse that you get the feeling she has almost made herself disappear. Then, something very big and very magical crashes into the snowy forest outside their house, and because of Callen’s compassion and magic skills, her life changes irrevocably. I really enjoyed reading this story. The relationship between Callen and her father is the dark center of the tale, and the turn it takes towards the end provided a huge payoff for me. Definitely not a sweet and easy happily-ever-after, but something better than that. The story is set in the fantasy realm created by Radcliffe in his Beyond The Veil trilogy. I haven’t yet read any of the novels or other stories set in that series, but this short story introduces the world easily and smoothly: you don’t need any forehand knowledge to read this story. It also whets the appetite for more of Radcliffe’s tales: dragons, wizards, magic, and a whole lot of strife? Yeah, count me in. Radcliffe’s writing is clear and vivid. You immediately get a feel for the characters in the story, the world they inhabit, and you can sense that there is a depth and richness behind and beneath it all: there is obviously a wealth of history, culture, other lives and tales, and a vast fantasy realm to explore beyond this short story. For me, this short story is a great introduction to Radcliffe’s writing, and his literary world. I agree, Maria. This is a wonderful story. I’m a big fan of Michael’s writing. His Beyond The Veil series is magical. He’s one of the writers who got me interested in fantasy fiction and he has a real talent for the genre.